The sun is shining, the tempurature is rising, and it's time for you to take a closer look at JPMorgan Chase. A recent analysis by Bloomberg and Leuthold Group found that, of all sectors traded on the public markets, banks are currently the cheapest. For the enterprising investor, this presents an opportunity, as not all banks deserve a cheap valuation, though. In short, many banks are high performing, and, thanks to the market's guilt-by-association pricing, can be had for a deep discount right now. JPMorgan Chase (NYSE: JPM) is one of those banks. Put aside everything you think you know about this megabank, and let's take a few minutes to break down what a bargain this stock really is. To put JPMorgan's value into context, we'll compare it to a large investment bank and another large, well-run commercial bank. This peer group will cover all the bank's bases -- its sizable investment bank operation as well as its traditional banking business. Currently, JPMorgan trades at a price-to-book-value multiple of 1.19 times. That's slightly more expensive than investment bank Goldman Sachs' 1.15 times. However, it is considerably below fellow megabank Wells Fargo's 1.74 times book. Most industry analysts consider Wells to be the best performing of the large U.S. banks, thereby justifying its higher price to book value ratio. On a price to earnings basis using forward earnings, JPMorgan again trades at a marked discount. Investors trade Wells at 12.4 times forward earnings and Goldman at 10.7 times forward earnings. JPMorgan trades at a meager 10.2 times forward earnings. Almost unbelievably, JPMorgan meets or exceeds each of these banks -- and many, many others -- on most of its core operating metrics. After even a quick financial review it becomes clear, at least to me, that JPMorgan deserves a multiple much closer to that of Wells Fargo. The bank was the second most profitable bank in the U.S. in 2014, trailing Wells by about 4%. Goldman's $8 billion in earnings trailed JPMorgan by about $14 billion. 2014 earnings per share grew at a 22% clip year over year, compared to a meager-by-comparison 5% at Wells Fargo and 10% at Goldman. Return on tangible common equity for JPMorgan was 13%. That trails Wells Fargo's 16%, but beats Goldman's 12%. Likewise, year-over-year growth in tangible book value per share increased at JPMorgan by 10%, behind Wells' 14% and ahead of Goldman's 7%. Is JPMorgan outperforming Wells Fargo? No, but it's not far behind. And that's exactly the point. For JPMorgan to really be worth just 1.19 times price to book value, then its performance should be significantly worse than Wells Fargo's. But it's not. It's pretty doggone close. Are investors worried about it being too-big-to-fail? There is an argument that the nation's largest banks trade at a discount, JPMorgan especially so, because of their too-big-to-fail status. The argument goes that because of the increased capital requirments and expenses for large banks via regulations like Basel III and Dodd-Frank, these banks won't be able to perform at the same relative level as smaller, less regulated institutions. That argument makes perfect sense in theory -- however, I see absolutely no evidence of it in JPMorgan's performance. From year end 2010 to 2014, JPMorgan grew its balance sheet from $2.1 trillion to $2.6 trillion. The primary driver of that growth has been about $440 billion of high quality liquid assets, a fancy way of saying cash and highly marketable securities like treasuries. On the one hand, that should ease any fears of its being too-big-to-fail. JPMorgan truly has a fortress balance sheet that can almost certainly weather any economic storm. But shouldn't these low-yielding assets hurt the bank's returns? To answer that question, let's look at the bank's tangible book value per share over the past 10 years. This measure is a good proxy to assess earnings and growth in one convenient number. 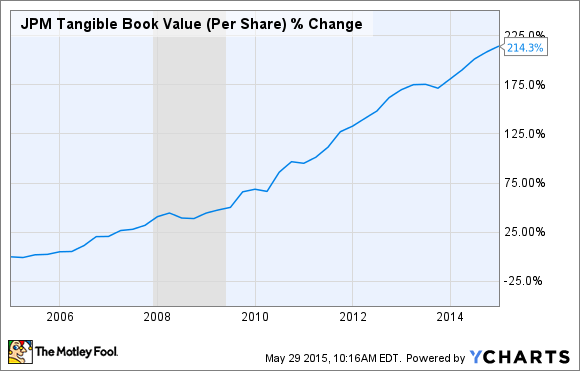 Year over year from 2013 to 2014, tangible book value per share grew 10%. The three-year compounded annual growth rate (CAGR) is also 10%. The five-year CAGR is 11%. The ten-year CAGR is 11%. That kind of consistency is impressive during any ten year span, but it is absolutely remarkable in light of the volatility and dramatic change seen in banking over the past decade. There was the introduction and rollout of the heightened Basel regulations, the financial crisis, the great recession, the London Whale scandal, and Dodd-Frank, among others. That period of time also includes at least $22 billion in after-tax legal expenses the bank was forced to pay in settlements and legal fees in the aftermath of the crisis. Could JPMorgan just be an outlier? The exception that makes the rule? Sure. In fact, I think that is highly likely. But simply because you are able to do more with less than your peers doesn't justify trading at such a deep discount. If JPMorgan is so exceptional that it can shrug off these massive regulatory burdens, that justifies a premium, not a discount! And perhaps the best part of all? The next few years should see a massive rise in JPMorgan profits as the Federal Reserve begins to raise interest rates. JPMorgan management estimates that rising rates could increase annual profits by $4.5 billion by 2017. They project the bank's earning power at that time to be around $30 billion per year, a 36% increase from 2014's reported earnings. The bottom line is that JPMorgan is high performing, has huge upside, and seems, at least to me, to be flat out cheap.